The WAP4 is one of my favorite electric locos. (Well, I’ve an internal tussle going on for the favorite spot between the WDM2 and the WAP4, but that can wait later). 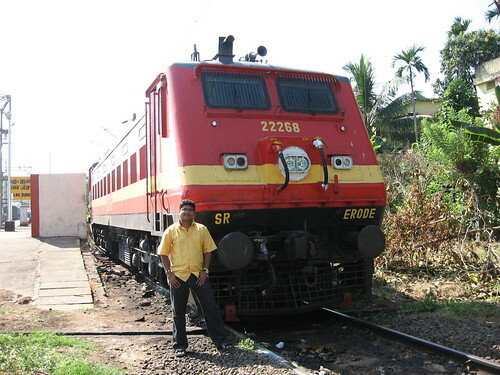 Here’s a video of my first ever footplate* ride on a WAP4 in Kerala in 2007. The ride was awesome as we cruised along lush greenery. Check out the assistant loco pilot call out the signals. Creating this video required some deft editing skills, especially since I didn’t want to show the loco drivers. Windows Movie Maker rocks. Enjoy the ride. To ride in the cab of a locomotive, from the old term footplate from steam days, referring to the horizontal surface projecting from the locomotive frame, on which the loco cab was constructed. Although diesels and electrics do not have a footplate like that, the terminology persists. How can one travel inside a locomotive? Does it require any permissions?